The first Silverlight-for-SharePoint samples have been released, with doco, sample code, sample webpart and videos showing how to install. All of the (6) samples available have both Silverlight 1.0 and 2.0 versions – I thought I’d go for the NEW version, even though it’s BETA (only a dev/play VM anyways). There is also a “container” WebPart, which can be used to host a XAML file, or XAP file (new 2.0 version). This would be very useful – kinda like a Silverlight Content Viewer. Contains a DOCX for the WebPart projects. The sample consists of two projects: one for the Silverlight 2 application and one for the SharePoint Web Part. There are TWO files (DOCX) – one each for the Silverlight 1.0 and 2.0 versions. Contains the source code for the THREE WebParts. For the 1.0 and SilverlightPart, there is a single project with the necessary CS files & lots more. For the 2.0 version, there are actually TWO projects : the Silverlight 2.0 application project – and the WebPart to host the Silverlight application. Again – THREE files, showing how to install, and activate each of the WebParts – and then add to the page. Nothing special – but there are some cool bits within the video clip for the SilverlightPart control. NB. All of the SIX sample projects have this same structure – DOCO, SOURCE, SETUP and VIDEO – very easy to get started and see how it works. 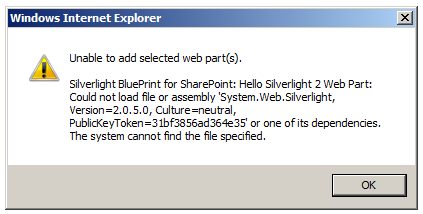 Check the /ClientBin/ directory of your SharePoint site for the existence of Silverlight.js. If missing (YEP ! ), copy it from C:Program FilesMicrosoft SDKsSilverlightv2.0Tools. Thanks to Ian Morrish for the above tips/links – cool stuff ! Finally – HELLO WORLD ?!!? Nooooo !! The error no longer appears – but just shows as an empty WebPart box. *hhmmm* Will have to investigate some more. It is a BETA version after all !! Have found some things that may be the cause/solution, after cracking open the code within Visual Studio 2008. I was still getting an error on build, so I removed the POST-BUILD step – and run the PACKAGE.BAT – and then INSTALL.BAT files myself. Interestingly, there is a bug/error in the PACKAGE step – which bundles up all files using the Solutionwsp_structure.ddf file. I can now step through/into the code for the WebPart – and ensure that each line is being executed – but STILL – no output !! *phew* Will keep looking – something will pop out sooner or later…!